Design Green Glitter Christmas Wristbands Online Now! Looking for unique stocking suffers? Our Merry Christmas wristbands are the perfect gift for parties, church groups, youth groups, secret Santas, classrooms, and many organizations. Christmas wristbands from AmazingWristbands.com come with a festive glitter effect and are made of high quality silicone that is comfortable, latex-free, and non-allergenic. You can get into the Christmas spirit with customized wristbands from Amazing Wristbands. Wristbands with message such as "Keep Christ in Christmas" and "Just Say Merry Christmas" help you spread your personal Christmas message. 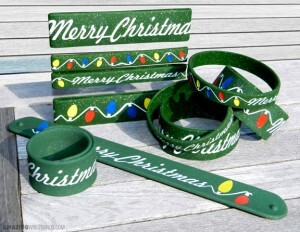 You can create any message you'd like with custom Christmas wristbands. Choose traditional red and green Christmas colors, and add fun effects such as glitter, segmented colors, or swirled colors. Customize your Christmas wristbands with clip art such as a cross, snowflake, or something you create yourself. Buy our Christmas Bracelets Now! Why Buy Christmas Wristbands from Amazing Wristbands? Amazing Wristbands is a leading provider of customized silicone wristbands available online, including Christmas bracelets. Our custom made silicone wristbands are comfortable, durable, and non-allergenic. Most importantly, our wristbands are completely customizable. Our professional and friendly customer service agents will help you create your customized Christmas wristband that will spread cheer and positive Christmas messages. In addition to standard wristbands, AmazingWristbands.com also offers slap bands, adjustable bands, USB bands, silicone rings and silicone key chains. 100% Silicone for your Christmas awareness campaign. FREE Shipping for personalized Christmas wristbands in the U.S.
FREE artwork and design for your Christmas wristbands. FREE Color Matching – choose red, green or one of our many other colors!